After four days of action and a slew of European talent shooting for success, it was a tournament virgin who finally took down GSOP Vienna this weekend. Having welcomed 304 grinders to the felt late last week, the 1,000+100 event saw some familiar faces – such as Manig Loeser and Thomas Butzhammer – make it into the latter stages, but inexperience proved the key to success. While the likes of Bjorn Berner and Karel Kratochvil brought a wealth of live poker experience to the final table, Jouni Kallio had none. However, despite it being the Fin’s first live tournament, he put on a measured performance in the finale. Indeed, even when the blind levels were dropped to 15 minute intervals, he kept his nerve and managed to overcome Kratochvil in just a few hands. 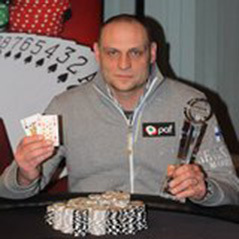 Kallio’s win has not only given him a perfect tournament record, but an extra 65,130 in his bankroll, plus the honour of being GSOP Vienna champion.